I have employed skills acquired helping my parents stringing, designing traditional Santo Domingo jewelry. Remember the old style Thunderbird necklaces inlaid on battery casings or records, being sold along highways or on the plaza in Santa Fe? Those are the inspiration for my art. My jewelry has evolved from traditional Santo Domingo turquoise "heishi" and "Depression Era" work to a modern, contemporary, mosaic, multi-colored inlay jewelry, that is versatile for formal and casual wear. Using natural stones, shells, and turquoise, my designs are free form inlay where no two pieces are alike as each stone, shell or turquoise is cut to fit a design right out of my memory. I try to find different types and colors of stones, unusual shapes of shell, cutting them at different angles to get the desired look. Using different colors of turquoise from different areas of the country or world is not out of the question and can give a necklace or pendant an unusual look. Lately, I have used silver filings to create a "glitter" effect to many pieces. Sometimes I do not know what a piece will look like until it is finished. My pieces have fooled many of my customers and even seasoned art collectors by asking, "How did you paint these designs?" Until told that these are the natural colors of my material and how they are intricately inlaid, are they amazed in the detail of my work. I currently live on the Santo Domingo Pueblo with my husband, Lorenzo (also a jeweler/metalsmith) and four children. Our studio, workshop is behind the house and we have had many of our customers tour the facility and we show them the materials, tools, and equipment we use in our work. We love showing people our studio as it gives them the perspective of the work and a deeper appreciation of it. Native Americans have been using spiny oyster shells in their jewelry for hundreds of years. Spiny Oyster or Spondylus is a type of bivalve mollusk found in all subtropical and tropical seas, usually close to the coasts. They are not, in fact, oysters but rather they are in the same family as scallops. While they are not closely related to true oysters; they do share some habits such as cementing themselves to rocks rather than attaching themselves by a byssus. Shown here are examples of actual purple and orange spiny oyster shells (not for sale). As you look at the raw shells, imagine the cutting & polishing skills required to turn these rough shells into such elegant finished jewelry! We have lots of spiny oyster jewelry available for sale on our website. Archaeological evidence indicates that pre-historic peoples have been trading spiny oyster shells to make bangles and other ornaments for thousands of years. Spondylus harvested from the Gulf of California were traded to tribes throughout Mexico and the American Southwest. There are many Santo Domingo tribal members making mosaic inlay and heishi jewelry these days, but here are three Kewa artists whose jewelry really stands out from the crowd. All three of these Santo Domingo jewelry makers have very distinct and unusual styles. Christopher Thomas Nieto is a young self-taught jeweler, whose work just keeps better and better! He has become famous for his intricate and innovative mosaic inlay and high quality heishi work. He inlays on round surfaces, he inlays the sides of his pieces, and he incorporates many different shapes into his jewelry! Timothy Bailon is another Santo Domingo native whose style is very different from the traditional Kewa jewelry. His jewelry is in high demand. This photo shows some of the latest designs by Chris and Timothy. Mary Tafoya is one of our favorite jewelry makers who creates unique contemporary works of art. Her colorful abstract jewelry has become a favorite of many Native American jewelry lovers. Her jewelry is colorful, somewhat "folksy", even whimsical, and her unique designs are extremely popular. She learned her jewelry making techniques from her parents. She has taken this ancient art of mosaic where no one else has, while staying very traditional in technique. She uses different types and colors of stones, unusual shapes of shell, cutting them at different angles to get the desired look. Feast your eyes on some of her original pieces! Visit our website tumbleweedsjewelry.com for our latest selection of jewelry by these ground breaking artists. It is with a heavy heart that I write this post to tell that one of my favorite artists, Orville Tsinnie, passed away recently. Orville passed away on May 23, 2017. Orville was a extraordinarily talented silversmith and a wonderful big-hearted man as well. The Navajo world has lost one of its greatest and most treasured artists. He will be dearly missed. Orville Tsinnie was a master Navajo silversmith who had been making jewelry since the 1970s and had won numerous awards, including a Lifetime Achievement award from the Indian Arts and Crafts Association (IACA), an honor that brought well-deserved recognition to this fine American Indian artist. Orville was a perfectionist, hand picking and polishing only the highest quality natural stones. He cut, polished and set the stones by hand. The level of craftsmanship in Orville's work is superior. His designs were flawlessly executed, his soldering technique very clean, and his finishing and polishing meticulous. This careful attention to detail set Orville's jewelry apart from many others, and revealed the pride he took in his work. A steady presence in the world of American Indian art for over forty years, Orville Tsinnie's work created some of the finest and unique Native American hand made jewelry on the market today. His works are highly collectible. We had the opportunity to meet with and purchase jewelry from Orville many times over the years and it was always a pleasure to visit with him, his wife Darlene, and his children and grandchildren. 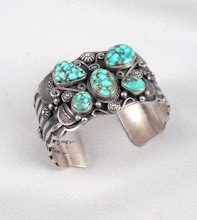 We saw him often at various Native American Jewelry markets and also visited him at his studio in Shiprock, New Mexico. 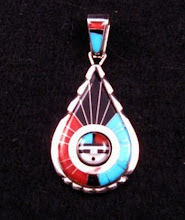 All the Orville Tsinnie jewelry that we sell on our website was purchased directly from the artist or from his family. We last placed an order from Orville a week before he passed away. His family contacted us several weeks after his death to tell us that he had finished our order before he died and that everything was complete except for some polishing. The photo below shows that jewelry. 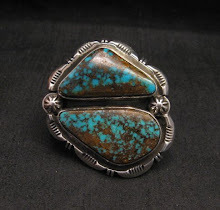 Please visit our website https://www.tumbleweedsjewelry.com to add a piece of Orville Tsinnie's jewelry to your Native American jewelry collection. We were sorry to hear about the recent death of Navajo silversmith, Gary Reeves. Gary was born in 1962 in Gallup, N.M. He learned silver work in 1974. He was the brother to David Reeves and half brother to Sunshine Reeves. While each artist has his own individual style, they all share an affinity for complex engraved and hand stamped geometric designs and they are all a part of recreating and popularizing the old Navajo designs of the early 20th century. They call their style Navajo Revival Style. 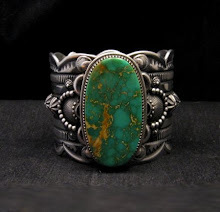 Gary filled his old style silver with lots of stamp patterns and used high quality pieces of turquoise. He had won many awards for his exceptional jewelry.